PRICE JUST REDUCED﻿DEALER’S CHOICEis in excellent condition and loaded with upgrades. The desirable three stateroom, two head layout sleeps six comfortably and is complemented by a spacious Salon area and well-appointed Galley. Powered by Cummins 370hp 6BTA5.9L-M3 diesels, she cruises at a comfortable and efficient 18-20 knots with 350 mile range, topping out in the low 20's. Highlights include an Onan 13.5kw genset, three-zone air conditioning reverse cycle, New Garmin navigation electronics, Bow and Stern thrusters, Sirius Satellite Radio, and heavy-duty Tender Crane mounted on hardtop, just to name a few of the highlights. Boat has been lift kept from 1/10/2014 to present. Engines, generator and Air conditioning systems flushed with fresh water after each use. Complete 1,000 hour service (1/2017) at 1,080 hours with only 1,170 hours on her now. Present Owners are very experienced and knowledgeable and have taken pride of ownership since 2007. This yacht is turnkey and ready to go.Easy to see in Stuart, FL. Just 45 minutes north of West Palm Beach International Airport (PBI). United Yacht Sales New Jersey would love to guide you through a personal showing of this 49' Meridian 490 Pilothouse 2006. This yacht for sale is located in Stuart, Florida and priced at $269,900. For a showing please contact us by filling out the form on this page and we will get back to you shortly! The 490 Pilothouse model is Meridians’ most popular pilothouse to date!! 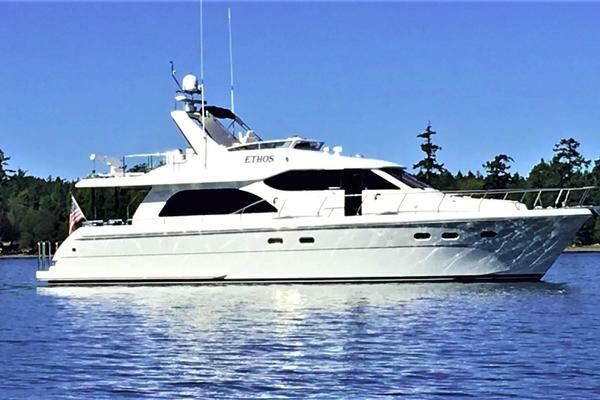 The 490 Pilothouse offers three Staterooms plus two full Heads, a large well thought out Salon, Galley and Entertainment Center on the main deck level surrounded by large windows. 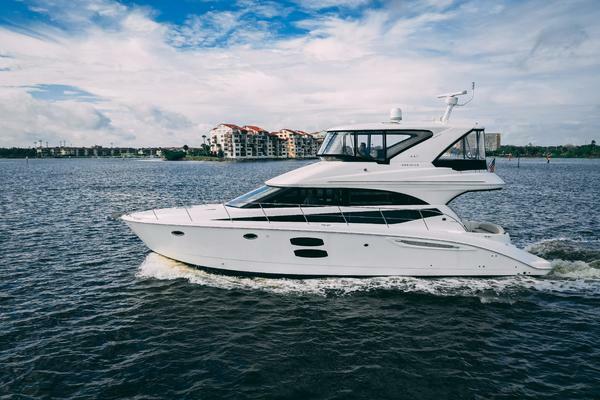 The Pilothouse offers comfortable piloting in any weather condition along with seating for Guests, the upper Flybridge seats a large group in comfort, the Flybridge helm is fully outfitted to cruise in comfort and security. The self-bailing Cockpit with large transom door allows for lounging or fishing with easy hose-down clean up.Entering the Salon from the large aft Cockpit, Owners and Guests will immediately notice the elegant high gloss cherry featured throughout the interior. The large L-Shaped sofa on the starboard side provides generous seating as well as folds out into a bed for overnight Guests. Opposite it is a really comfortable reclining lounge chair. The large flat screen TV is visible by both areas. The U-Shaped Galley takes up the port forward section of the Salon. The Galley has household appliances, solid surface countertops, two SS sinks, and is complemented by teak and holly flooring. Moving forward and down into the Main Companionway, the VIP stateroom is located on the port side in the midship portion of the vessel. The VIP consists of a longitudinally arranged double berth, nightstand, overhead lighting, under-berth storage, cedar lined hanging locker and porthole windows, providing plenty of natural sunlight. Directly adjacent to the VIP Stateroom is the Guest/Day Head with enclosed Stall Shower. Forward of the VIP Stateroom is the Master Stateroom with a Queen sized Island Berth. It features an En-Suite Head and stall Shower/Bath Tub, full sized hanging locker and ample drawer storage. The third Stateroom, which can be accessed from the Master Stateroom or the centerline passageway, has a settee with hinged upper and lower berths, allowing it to double as a dressing room. It has a large closet with lots of drawer storage. Back to the Salon, the raised Pilothouse is up and forward. Visibility from the Helm Chair is excellent, and access to the foredeck is made easy by doors located on both sides of this wheelhouse. Aft to port is L-Shaped lounge seating with a folding cherry table, allowing Guests to enjoy the view of the surrounding environment in total A/C or heated comfort out of inclement weather.From the Pilothouse up four inside stairs is passage to the upper Helm/Flybridge through a dog-down Lexan door. The Flybridge is covered by a bimini top on a SS frame enclosed on all four sides with opening Eisenglass. The Captain is treated to a comfortable adjustable helm chair with a full complement of Controls and Navigation equipment. There is a huge L-Settee to port easily seating 4-5 with a long straight Settee on the starboard seating another 3-4.Aft of the enclosure is the Tender electric crane and built-in chocks to store your tender on the hardtop. There’s more space to store bikes, motorbikes, or other toys. There is also a hatchway leading down a ladder for access to the aft cockpit. The present Owners have really taken care of this boat with no expense spared to maintain it. They have purchased another boat and reluctantly want their pride and joy to go to a new caring Owner. There are lots of spare parts and equipment. She is ready to cruise. You won’t find a better boat for the money.